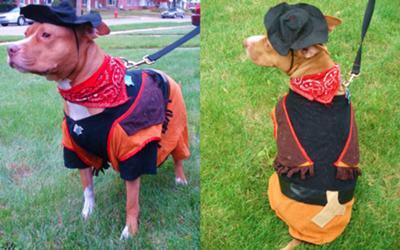 Duke dresses as a cowboy because John Wayne was called "The Duke". So he is either a cowboy or John Wayne "The Duke"! All that's missing is the horse! Duke as The Duke! John Wayne would be proud. This is one cute dog, for sure! Cowboys are awesome; Duke is awesome. Enough said. Very fitting. He is a very good looking Pit. They dont call him the duke for no reason! The MOST lovable awesome pit ever!!!! Can i get a WOOT!?! Duke is royalty at its best! What a perfect combo...Duke as The Duke! What a regal pup! He makes a good "Duke"!